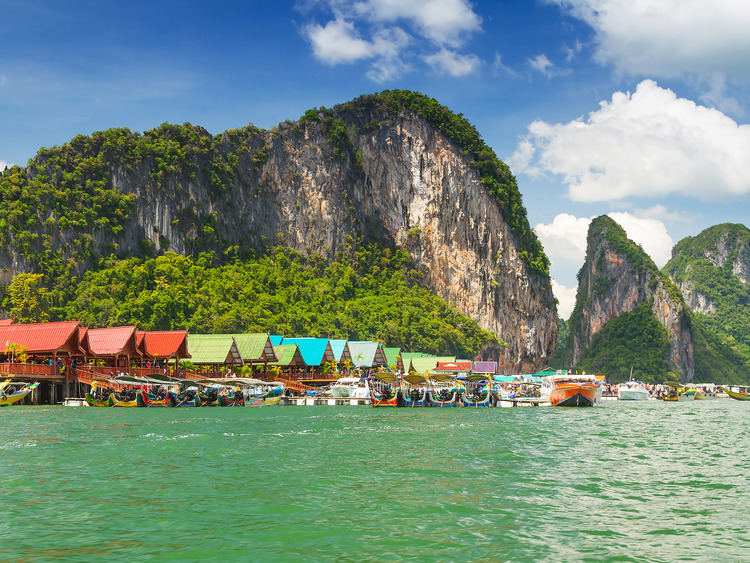 On board a speedboat we will leave Royal Phuket Marina and head for the mangroves and channels of Phang Nga Bay. Our journey continues onto an array of chalky rock towers which emerge from the water and lead right up to the marvellous Koh Ping Ghan, also known as the Island of James Bond, famous for providing the backdrop for the James Bond film, "The Man with the Golden Gun". The beauty of Koh Tapu (Nail Island), next to the Island of James Bond, will literally leave us speechless. Some advertising campaigns for famous perfumes were staged here. We will then head to Koh Panyee, where we will visit an old fisherman's village which dates back 150 years. Here, it is possible to speak to local people, visit the island's mosque with its striking minaret and stroll around amongst the "stalls and shops" within this small community, entirely supported by piles. Once we leave the island, we will head onto the island of Rang Yai, where a delicious lunch awaits. In the afternoon we will have some free time to relax on the island's splendid beach and cool off swimming in the crystal-clear waters. Finally, we will return to our speed boat and go back to the Phuket Boat Lagoon ﻿ where the coaches awaits to take us back to the ship. Pregnant women cannot take part to this tour. The speed boat transfer from the Boat Lagoon takes approximately 1 hour.